See scan - very good condition. This is a nice WWI German Royal Kaiser Wilhelm II 1914 commemorative medal for the begining of the war. Front shows the bust portrait of the King and reverse a propaganda / patriotic battle scene of German soldiers crashing Russian, French and English Army. Medal is made of aluminum. 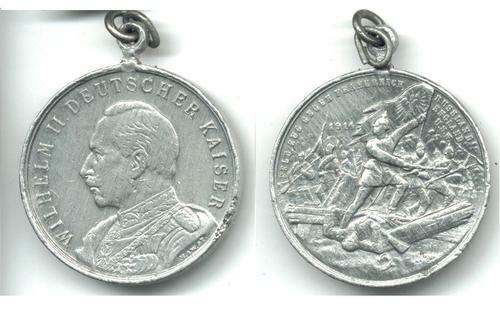 Nice militaria / military collector piece and one of the nice German medals.